Many patients with vision problems like the idea of vision correction without wearing spectacles or contact lenses. Not all of these patients are good candidates for Laser eye surgery. In fact some patients simply do not want to undergo what can be seen as unnecessary surgery. If that describes you, don't worry - because we offer an advanced corneal reshaping technique known as orthokeratology, or Ortho-K. This non-surgical technique can produce changes to the way your cornea refracts light. Deformations in the shape of the cornea cause refraction to go wrong in various ways, producing the fuzzy images characteristic of myopia, hyperopia, and astigmatism. Glasses and contact lenses are curved to "pre-refract" incoming light to compensate for your personal degree of refraction error. Laser surgery actually corrects the shape of cornea itself, eliminating most of the visual errors that might otherwise call for corrective lenses. Some of our patients simply do not like the idea of surgery, or they want a reversible procedure. In theses situations Ortho-K may be an ideal choice. At Martin Reynolds Opticians we map the shape of your corneas precisely and then create special Ortho-K contact lenses. Unlike standard contact lenses, you'll wear these lenses at night. The lenses perform subtle corneal reshaping as you sleep, meaning that you can take them out the next morning and enjoy perfect or near-perfect vision. Ortho-K is great for children. Having the freedom from spectacles and contact lenses during the day allows children to participate in all activities, and it also means the child is wearing their contact lenses at home in a safer, controlled environment. We fit Ortho-K lenses from 7 years old and it has been shown to be a significant benefit in myopia control. Ortho-K can help you see clearly for one or two days at a time, or possibly even longer. By wearing them regularly at night, you can maintain your clarity of vision for as long as you decide to continue using them. If you decide to use another form of vision correction, simply stop wearing the Ortho-K lenses and your corneas will assume their natural shape once again. Suitability examination - £35.00. This is a supplement to your eye examination and lasts 30 minutes. The suitability exam will allow us to take additional measurements which are outside of the routine eye examination and discuss Ortho-K in more detail plus answer any questions you may have. There is no obligation to proceed further. The initial assessment and fitting - £180.00 (this includes several appointments over a 2 week period including teaching insertion and removal of lenses from the eye). Monthly payment - £45.00 (includes all eye examinations, 6 monthly replacement contact lenses and solutions). If you have any questions or would like to try Ortho-K please call us on 01279 757767. 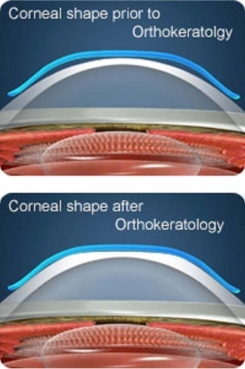 For more information visit www.orthoklenses.com.